I’m glad I did. They explained they were looking at some American Indian petroglyphs. I could see the reddish-orange designs on a section of rock about 50 feet up. 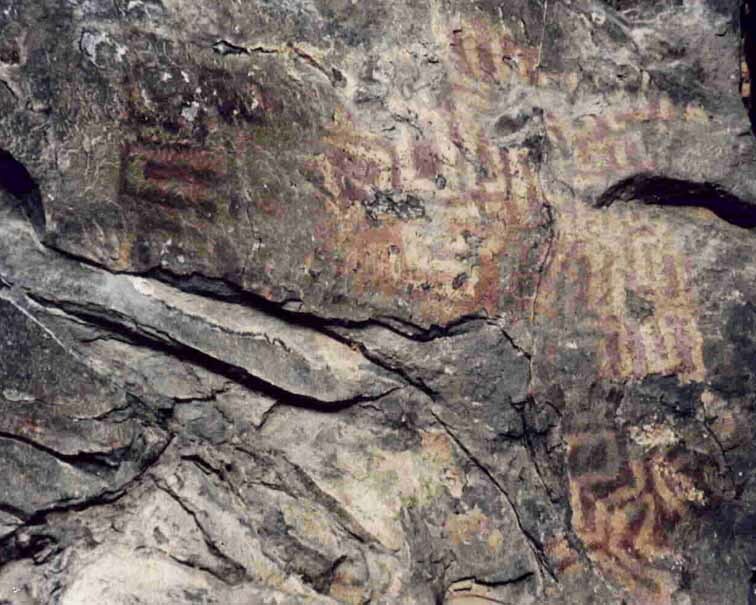 They explained that the Paint Clan of the Cherokee Indians had created the petroglyphs. I think I have lamented in this column before that while doing bird points for the Forest Service from Hiwassee Dam to Grandfather Mountain and from Roan Mountain to Mt. Mitchell to Brevard I often encounter a lot of cool stuff. But alas, the “job” part of this endeavor – having to survey all the points within a six-week time frame – often means there is not much time for following those enticing side trails. I have traveled River Road at least once a year since 2007. And where you turn onto River Road from Hwy. 209 there is an historical marker that states, “Pictographs on cliff face were created by Indians ca. 2500 B.C. & long have been landmark for travelers. 5 1/2 mi. N.W.” But I have almost always turned right on FS Road 468 to get to my points, went in, surveyed and beat it back out to 209 and on to other points, never taking the time to try and track down the pictographs or petroglyphs. But today, someone had found them for me. I did a little Internet Research when I got home to learn more about the site. It seems botanist Andre Michaux had made notes about a “red-painted rock” during his travels back in 1796. And as early as 1799 a Tennessee border survey noted that campfire soot was obscuring some of the petroglyphs. Advertising for a stagecoach line in 1859 stated that the line crossed the mountains in full view of the Painted Rocks. A study in 2006 revealed the petroglyphs were around 5,000 years old. The pigments used were said to be of superior quality and complex design. All of the ingredients were determined to be local. The Paint Clan were noted as healers and sorcerers. They were the keepers of ritual and ceremony and the only ones allowed to make a special red paint used for ceremonial purposes. One explanation for Paint Rock is that it was a stopping point for the Cherokee on their way to the healing hot springs. It was a place for prayer and contemplation – the perfect setting for the Paint Clan’s powerful red dye.